Open from 12 noon Mon-Sat; closed Sun. NB: closes 7pm Mon. 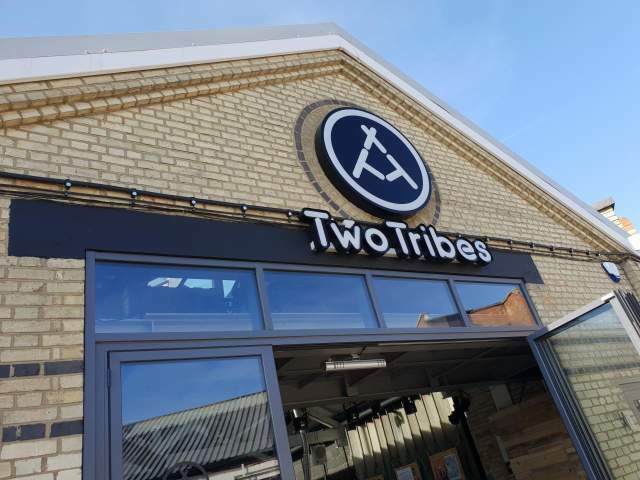 Two Tribes have become the latest brewery outside London to set up base in the capital, but instead of just opening a tap room they’ve set up a new production brewery just north of King's Cross, and this is their rather classy tap room. One large room with a pitched roof and skylight, with the brewery on display down the back, the bar offers up to 15 draft keg lines and around 30 bottles/cans. On our first visit, all drafts were Two Tribes beers, with two of them having been brewed on site – and highly impressive these two were – with this proportion set to increase. The bottles and cans were from a stellar range of breweries on an impressive list. The space is light, bright and airy, and on a good day the doors will open to the sizeable outside space, which provides an excellent sun trap. Hugely impressive, this place is potentially outstanding. Just under a mile north of Kings Cross, so it’s a decent hike – or try the 390 bus. Once you arrive, the brewery is tucked away up the stairs and round the corner at the back of the site. Note, on weekdays they open at 11 but beer is only available from 12.